Watched 19980706 Theatre. Harkins Theatres [Mulan] 4:55P. $4. Watched several times. Once on DVD. 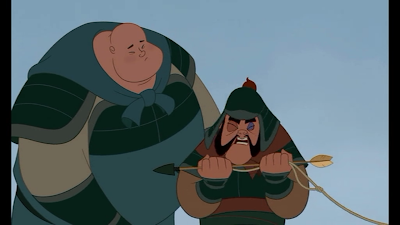 Mulan (1998) Tony Bancroft, Barry Cook. 88 min. 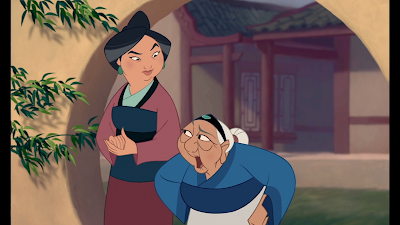 Mulan, with the help of her mother and grandmother, gets ready to meet the matchmaker. Unfortunately, her meeting with the matchmaker doesn't go well. 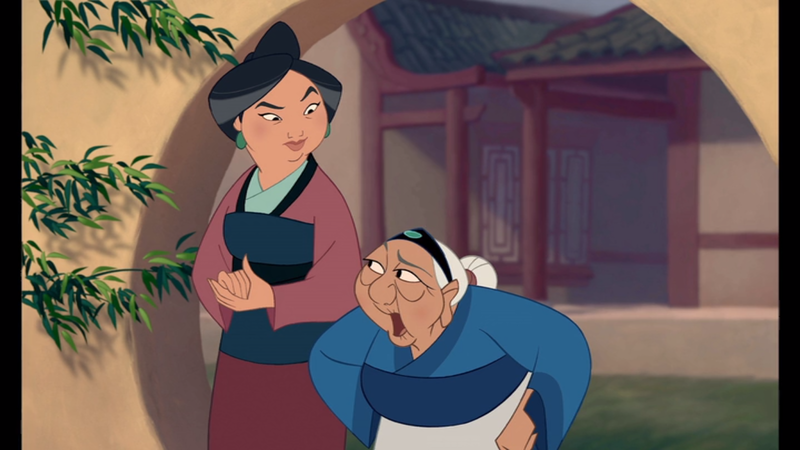 In fact, the matchmaker says that Mulan will never bring honor to her family. Soon after, there is a notice that the Huns have invaded, and a man from each family is to join the army. 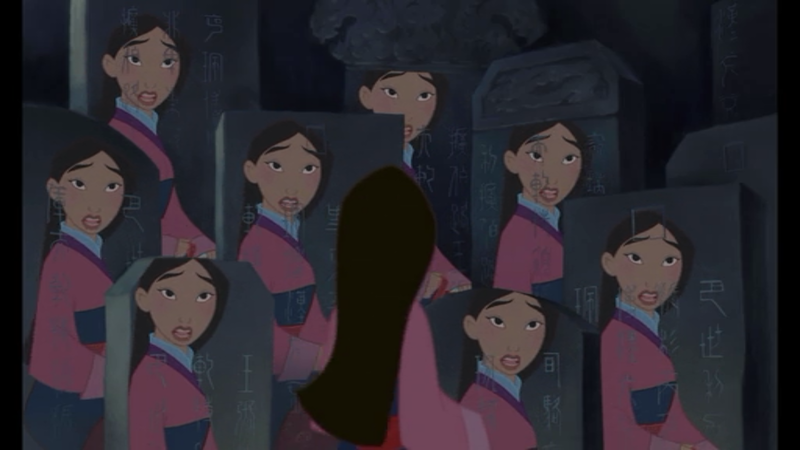 Unfortunately, Mulan's father is the only man in her family. 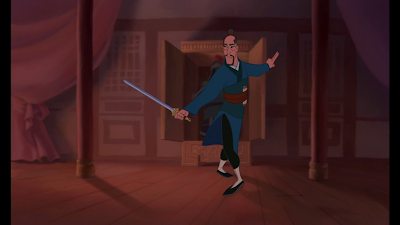 He is, however, old and Mulan takes matters into her own hands. She cuts her hair, dons her father's armor, and rides off to join the army. Her ancestors send a guardian to watch over her, but Mushu (Eddie Murphy), the gong ringer, mucks things up. He secretly goes in place of the Great Stone Dragon. 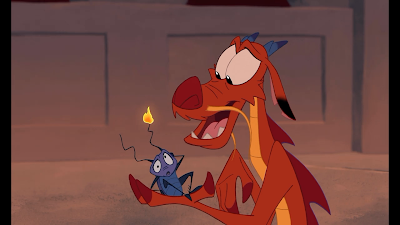 When Mushu meets up with Mulan, he tries his best at showing Mulan how to be a man. While his tips aren't useful, Mulan manages to join the army without anyone suspecting that she is a woman. Captain Li Shang is put in charge of training the new recruits and their development is shown by song. 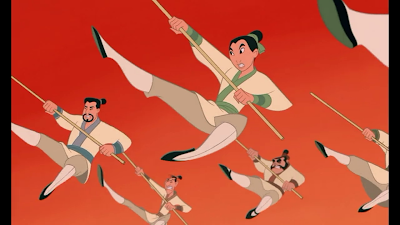 While Mulan can't keep up with the other soldiers physically and asked to go home, she redeems herself and subsequently excels at all the skills. 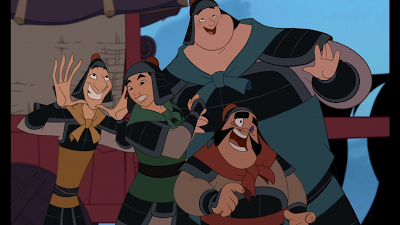 Eventually, with Mushu's meddling, Captain Li Shang and the newly trained troop head out to meet with his father's troops. However, they arrive to see that the Huns have decimated his father's troops. As they leave, a rocket (fired by Mushu) gives away their position and the Huns attack. 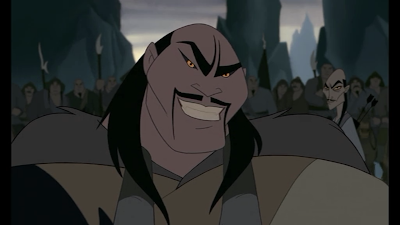 Mulan, blamed for the rocket fire, redeems herself in the end by causing an avalanche with the last available cannon and wiping out all but the toughest of Huns. Injured in the battle, her wounds are tended for and her true gender is revealed. 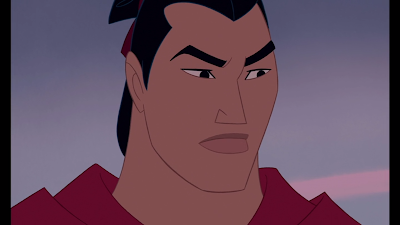 While Mulan's actions would normally be penalized by death, Shang, as repayment for saving his life, sends her home. The story, however, doesn't end here and Mulan eventually brings honor to her family. You'll have to watch the movie to find out how! 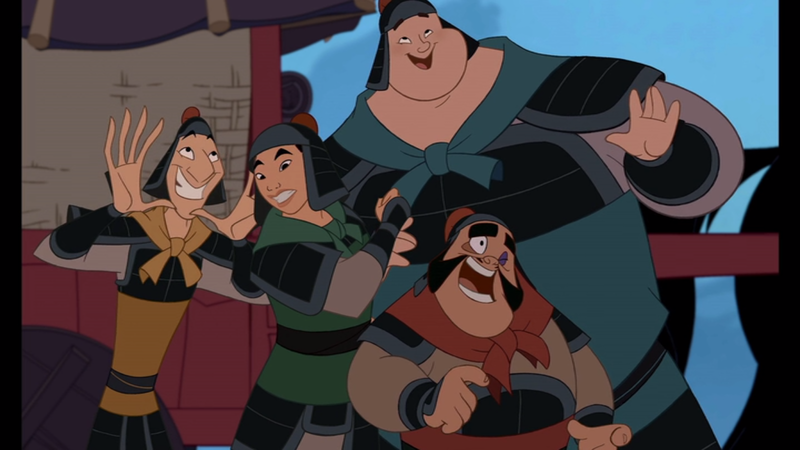 One of the reasons I enjoyed Mulan was for the great music; I love watching music-filled Disney films! In addition, the film is full of adventure and fun. It also features a heroine! 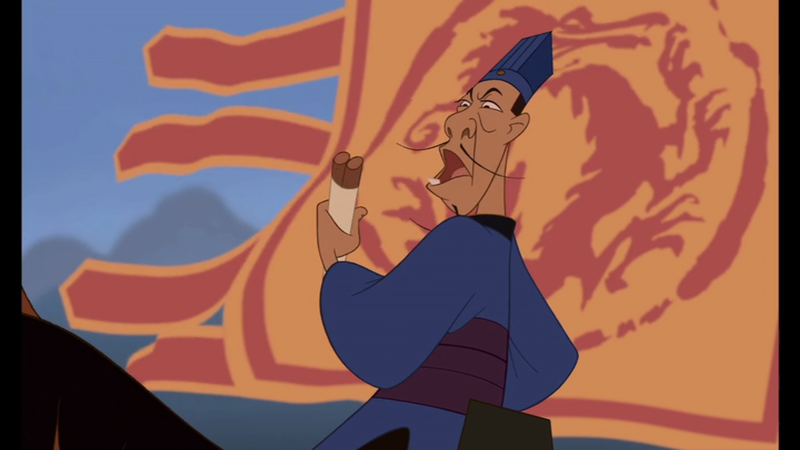 Last, but not least, the film had great laughs from Mushu (Eddie Murphy). Favorite song and sequence: "I'll Make a Man Out of You" by Donny Osmond. Apparently I haven't seen this movie in the last six years. "How lucky can they be? They're dead." Technically its the cricket's fault. The cricket only has four legs. "Ah, I see you have a sword. They're very manly. And tough." "Be A Man" is one of the best songs in Disney films. It's clever because it also narrates the story. It's heartwarming when she begins climbing up the pole. 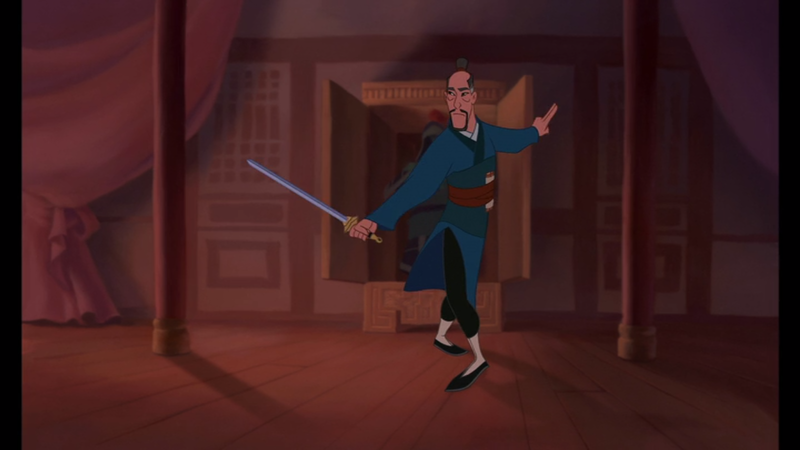 "Stand watch Mushu, while I blow our secret with my stupid girly habits." "Hey, I'll hold him, and you punch." I wonder if there's a recording where the song finishes instead of "Wish that I had." "A girl worth fighting." "You missed. How could you miss? He was three feet in front of you!" "Man, you are one lucky bug." Hmm, besides saving the entire troop, she also saved the captain's life. "I let them slip through my fingers." "And what are you, a sheep?" Oh, I don't think I ever got that before. It's a pun on 'Hun.' "Let's go kick some honey buns!" "Now that's what I call Mongolian barbecue." Oh, I don't think I noticed that one either. Mushu and Cri-Kee hitched a flight on a kite. And that's what they turned into the wings when he says, "Your worst nightmare." "You. Are a lucky bug." "I've heard a great deal about you, Fa Mulan. You stole your father's armor, ran away from home, impersonated a soldier, deceived your commanding officer, dishonored the Chinese Army, destroyed my palace, and... you have saved us all." Second happy moment in the movie (when they all bow). "Very well. You can have his job." Hehe. "Is she allowed to do that?" They all shrug. Hahahaha. "Oh! Sign me up for the next war!" "Sign me up for the next war!" "Would you like to stay for dinner?" "Would you like to stay forever!?" Hmm, while Christina Aguilera's recording of "Reflection" (played during the credits) is good, I like the simplicity of the song as sung within the movie. In contrast, I like "Tale As Old As Time" as performed by Celine Dion and Peabo Bryson more than when it was sung within the movie by Mrs. Teapot.